Discussion Should I wait for club fitting? Should I wait for club fitting? I am approx a 20 hcp and am in the market for some new irons. I have been working on my game weekly this winter and feel like I’ve made some significant progress with my irons after several lessons. 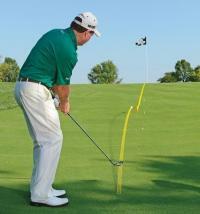 I do think there are a few portions of my swing that could improve, such as shallowing out. My question is: Do I get fitted for my irons now? My concern is I don’t want to get fitted for something and then tweak something unknowing like my attack angle. At the same time, my swing is never going to be perfect. You'll get differing opinions.. I think that on one hand, getting fit at any point is likely to improve upon something you bought off the rack and may help groove your swing.. at the same time though, if you are anticipating significant swing changes I think the best bang for your buck may be waiting until some of that steadies out. Granted, those of us (like myself) that aren't low single digits handicaps still all probably have some moderate changes that we could make and I wouldn't discourage you from getting fit just for that reason. Maybe it depends how much longer you plan on taking lessons. Do you think you will continue for awhile to come, or are you stopping in the foreseeable future? You can also discuss with your pro and see what s/he thinks about how many more significant changes you have coming. You'll get differing opinions.. I think that on one hand, getting fit at any point is likely to improve upon something you bought off the rack and may help groove your swing.. at the same time though, if you are anticipating significant swing changes I think the best bang for your buck may be waiting until some of that steadies out. Granted, those of us (like myself) that are low single digits handicaps still all probably have some moderate changes that we could make and I wouldn't discourage you from getting fit just for that reason. Maybe it depends how much longer you plan on taking lessons. Do you think you will continue for awhile to come, or are you stopping in the foreseeable future? You can also discuss with your pro and see what s/he thinks about how many more significant changes you have coming. I’ve had one lesson per month over the past 4 months and have worked each weekend on any adjustments (~200-400 range balls a week). I’d like to slow down on the lessons due to the cost. I have been told I’m a good iron player, which is why I would like to start with my irons in regards to a fitting. My trouble is with the driver, which I won’t be getting fit for for some time! Since you're game is still changing, probably won't achieve the full benefit of a club fitting. But there is nothing wrong having the lie angle fitted for now ( can be adjusted later if needed ) and off the shelf shaft will do fine for now as long as you had tried all of the flex you could swing. Don't let anyone tell you that you're a fit for certain flex just because your age or physical condition. Pick a set of irons that you like with OEM std shaft in the flex you like and have the lie angle fitted to you. You will be way ahead of the golfers 30 years ago, whom will probably just take the set from the rack to the golf course. A proper fitting should be considered when you're flirting with a single digit index and wish to continue on that journey. I re-read my post and had a typo.. I'm not a single digit and meant those of us that are not single digits still have changes coming. I think it depends how dedicated you are. I have taken one lesson in years, so I got fit to get the most out of my current swing. I think the above poster is right to some degree. I don't think you have to be close to a single digit to get fit, but if you are still expecting lots of changes there is the chance whatever you get fit into won't be a good fit next year. If you're ok with that, go for it. Otherwise can't hurt too much to wait. It's always possible you are practicing with totally wrong clubs for you (length, lie, flex, forgiveness, etc), but if you think they're reasonable I might try waiting just a tad longer (if you can stand it). work on what the teaching pro says. play for about a month to get your swing muscles in shape. Unless you're oddly proportioned, at this point, fitting isn't going do much for you. Body proportion doesn't take into account stance, or what type of shaft you need for your swing dynamics. If you buy new irons, many places will include the fitting in the purchase price. If you haven't been fitted recently, do so to get clubs that fit, and to dump little worries you have. I wouldn't do a full fit. I would however get your shaft flex in a good median range where you can swing softer and harder without being punished. Get a shaft that you like the feel of. Get a shaft that is good all around such as DG S300 or similar. Something off the rack in your flex should be fine, just make sure they dont have a specific type shaft such as 'low spinning" or "high launch". Once you get more confident and consistent get a full fitting. Most of the time a "basic" fitting will come free with club purchases. Thanks for the input everyone. I’m opting to go for it and be up front with the guy- if he thinks I should wait we will turn it into a lesson. It’s just my irons, not a full fitting. And he is the fitter at the golf practice facility I joined, so I’m confident he won’t rip me off.